Achenbach, T. M. (2009). 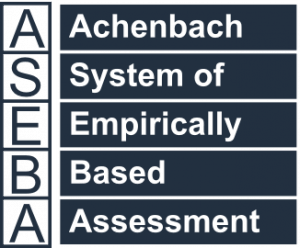 The Achenbach System of Empirically Based Assessemnt (ASEBA): Development, Findings, Theory, and Applications. Burlington, VT: University of Vermont Research Center for Children, Youth, & Families. Achenbach, T. M. (1966). The classification of children’s psychiatric symptoms: A factor-analytic study. Psychological Monographs, 80, (No. 615). Achenbach, T.M. (1974, 1982). Developmental Psychopathology. (1st ed., 2nd ed.). New York: Wiley. Achenbach, T. M. (2014). Using multicultural research to expand the scope of developmental psychopathology. In J. Burack & Schmidt (Eds. ), Cultural and contextual perspectives on development at-risk (pp. 7-38). New York: Cambridge University Press, 2014. Achenbach, T.M., Becker, A., Döpfner, M., Heiervang, E., Roessner, V., Steinhausen, H., & Rothenberger, A. (2008). Multicultural assessment of child and adolescent psychopatholgy with ASEBA and SDQ instruments: research findings, applications, and future directions. Journal of Child Psychology and Psychiatry, 49, 251-275. Achenbach, T. M., Dumenci, L., & Rescorla, L. A. (2002). Ten-Year Comparisons of Problems and Competencies for National Samples of Youth: Self, Parent, and Teacher Reports. Journal of Emotional and Behavioral Disorders. 10, 194-203. Achenbach, T. M., Howell, C. T., McConaughy, S. H., & Stanger, C. (1998). Six-year predictors of problems in a national sample: IV. Young adult signs of disturbance. Journal of the American Academy of Child and Adolescent Psychiatry, 37, 718-727. Achenbach, T.M., Krukowski, R.A., Dumenci, L., & Ivanova, M.Y. (2005). Assessment of adult psychopathology: Meta-analyses and implications of cross-informant correlations. Psychological Bulletin, 131, 361-382. Achenbach, T. M., McConaughy, S. H., & Howell, C. T. (1987). Child/adolescent behavioral and emotional problems: Implications of cross-informant correlations for situational specificity. Psychological Bulletin, 101, 213-232. Achenbach, T. M., Newhouse, P.A., & Rescorla, L. A. (2004). Manual for the ASEBA Older Adult Forms & Profiles. Burlington, VT: University of Vermont, Research Center for Children, Youth, & Families. Achenbach, T. M., & Rescorla, L. A. (2000). Manual for the ASEBA Preschool Forms & Profiles. Burlington, VT: University of Vermont, Research Center for Children, Youth, & Families. Achenbach, T. M., & Rescorla, L. A. (2003). Manual for the ASEBA Adult Forms & Profiles. Burlington, VT: University of Vermont, Research Center for Children, Youth, & Families. Achenbach, T. M., & Rescorla, L. A. (2007). Multicultural Supplement to the Manual for the ASEBA School-Age Forms & Profiles. Burlington, VT: University of Vermont, Research Center for Children, Youth, & Families. Achenbach, T. M., & Rescorla, L. A. (2007). Multicultural Understanding of Child and Adolescent Psychopathology: Implications for Mental Health Assessment. New York: Guilford Press. Achenbach, T. M., & Rescorla, L. A. (2010). Multicultural Supplement to the Manual for the ASEBA Preschool Forms & Profiles. Burlington, VT: University of Vermont, Research Center for Children, Youth, & Families. Achenbach, T.M., Rescorla, L.A., & Ivanova, M.Y. (2012). International epidemiology of child and adolescent psychopathology: 1. Diagnoses, dimensions, and conceptual issues. Journal of the American Academy of Child and Adolescent Psychiatry, 51, 1261-1272. Brigidi, B. D., Achenbach, T. M., Dumenci, L., & Newhouse, P.A. (2010). Broad spectrum assessment of psychopathology and adaptive functioning with the Older Adult Behavior Checklist: a validation and diagnostic discrimination study. International Journal of Geriatric Psychiatry, 251, 1177-1185. DOI:10.1002/gps.2459. Hofstra, M. B., van der Ende, J., & Verhulst, F. C. (2002). Child and adolescent problems predict DSM-IV disorders in adulthood: A 14-year follow-up of a Dutch epidemiological sample. Journal of the American Academy of Child and Adolescent Psychiatry, 41, 182-189. Ivanova, M.Y., Achenbach, T.M., Dumenci, L., Rescorla, L.A., Almqvist, F., Bilenberg, N., et al. (2007). Testing the 8-syndrome structure of the Child Behavior Checklist in 30 societies. Journal of Clinical Child and Adolescent Psychology, 36, 405-417. Ivanova, M.Y., Achenbach, T.M., Rescorla, L.A., Dumenci, L., Almqvist, F., Bathiche, M. et al. (2007). Testing the Teacher’s Report Form syndromes in 20 societies. School Psychology Review, 36, 468-483. Ivanova, M.Y., Achenbach, T.M., Rescorla, L.A., Dumenci, L., Almqvist, F., Bilenberg, N., et al. (2007). The generalizability of the Youth Self-Report syndrome structure in 23 societies. Journal of Consulting and Clinical Psychology, 75, 729-738. Ivanova, M.Y., Achenbach, T.M., Rescorla, L.A., Harder, V.S., Ang, R.P., Bilenberg, N., et al. (2010). Syndromes of preschool psychopathology reported by parents in 23 societies. Journal of the American Academy of Child and Adolescent Psychiatry, 49, 1215-1224. Ivanova, M.Y., Achenbach, T.M., Rescorla, L.A., Bilenberg, N., Bjarnadottir, G., Denner, S., …Verhulst, F.C. (2011). Syndromes of preschool psychopathology reported by teachers and caregivers in 14 societies using the Caregiver-Teacher Report Form (C-TRF). Journal of Early Childhood and Infant Psychology, 7, 87-103. MacDonald, V. M., & Achenbach, T. M. (1996). Attention problems versus conduct problems as six-year predictors of problem scores in a national sample. Journal of the American Academy of Child and Adolescent Psychiatry, 35, 1237-1246. MacDonald, V.M., & Achenbach, T.M. (1999). Attention problems versus conduct problems as 6-year predictors of signs of disturbance in a national sample. Journal of the American Academy of Child and Adolescent Psychiatry, 38, 1254-1261. McConaughy, S. H. (2013). Clinical Interviews for Children and Adolescents – Assessment to Intervention. (2nd Ed.) New York: Guilford Press. McConaughy, S. H., & Achenbach, T. M. (2001). Manual for the Semistructured Clinical Interview for Children and Adolescents (2nd ed. ).Burlington, VT: University of Vermont, Center for Children, Youth, & Families. McConaughy, S. H., & Achenbach, T. M. (2004). Manual for the Test Observation Form for Ages 2-18. Burlington, VT: University of Vermont, Center for Children, Youth, & Families. McConaughy, S. H., & Achenbach, T. M. (2009). Manual for the Direct Observation Form. Burlington, VT: University of Vermont, Center for Children, Youth, & Families. Reef, J., Diamantopoulou, S., van Meurs, I., Verhulst, F., & van der Ende, J. (2010). Predicting adult emotional and behavioral problems from externalizing problem trajectories in a 24-year longitudinal study. Journal of European Child and Adolescent Psychiatry, 19, 577-585. Reef, J., van Meurs, I., Verhulst, F.C., & van der Ende, J. (2010). Children’s problems predict adults’ DSM-IV disorders across 24 years. Journal of the American Academy of Child and Adolescent Psychiatry, 49, 1117-1124. Rescorla, L., Achenbach, T.M., Ivanova, M.Y. et al., (2007). Consistency of teacher-reported problems for students in 21 countries. School Psychology Review, 36, 91-110. Rescorla, L., Achenbach, T.M., Ivanova, M.Y., et al., (2007). Epidemiological comparisons of problems and positive qualities reported by adolescents in 24 countries. Journal of Consulting and Clinical Psychology, 75, 351-358. Rescorla, L.A., Achenbach, T.M., Ivanova, M.Y., Harder, V.S., Otten, L., Bilenberg, N., et al. (2011). International comparisons of behavioral and emotional problems in preschool children: Parents’ reports from 24 societies. Journal of Clinical Child and Adolescent Psychology, 40, 456-467. doi:10.1080/15374416.2011.563472. Rescorla, L.A. et al. (2007). Behavioral and emotional problems reported by parents of children ages 6 to 16 in 31 societies. Journal of Emotional and Behavioral Disorders, 15, 130-142. Rescorla, L.A., Ivanova, M.Y., Achenbach, T.M., Begovac, I., Chahed, M., Drugli, M.B., …Zhang, E.Y. (2012). International epidemiology of child and adolescent psychopathology: 2. Integration and applications of dimensional findings from 44 societies. Journal of the American Academy of Child and Adolescent Psychiatry, 51, 1273-1283. Stanger, C., Achenbach, T. M., & Verhulst, F. C. (1997). Accelerated longitudinal comparisons of aggressive versus delinquent syndromes. Developmental Psychopathology, 9, 43-58. Wadsworth, M.E., & Achenbach, T.M. (2005). Explaining the link between low socioeconomic status and psychopathology: Testing two mechanisms of the social causation hypothesis. Journal of Consulting and Clinical Psychology, 73, 1146-1153.